The Green Deal was given the stamp of approval yesterday as MPs finalised its secondary legislation. Despite this, Energy Secretary Ed Davey highlighted concerns that the interest rate at which the the government will lend money for energy efficiency measures will be around 7.5%, significantly higher than The Bank of England lending rate of 0.5% percent. That means that a homeowner who borrows £10,000 over a period of 25 years will owe £22, 000 - over double the original amount -which could ultimately deter potential customers and spell trouble for the Green Deal. Caroline Flint MP, Labour’s Shadow Energy and Climate Change Secretary, said: "If it’s done properly, a pay-as-you-save energy efficiency scheme could cut carbon emissions, create jobs and lower bills for families. But the Green Deal must be a good deal for consumers. The public want a simple and affordable scheme so they can improve their home and cut their energy bills. “It would be completely unfair if the public are forced to pay hefty penalties for doing the right thing and trying to repay their loans as soon as they can. The Government must come clean about what interest rates will be charged on the Green Deal so hard-pressed bill payers know it will save them money. "To make the Green Deal work, ministers should use the Green Investment Bank to provide Green Deal finance at an affordable rate for families and businesses." Decc refuted the claim that customers would be stuck with a high interest rate, saying that is was possible for customers of the Green Deal to take out smaller loans and repay them at a faster rate. Originally outlined in 2010, the Green Deal was designed to make energy efficiency a more affordable option for UK homes by allowing homeowners to take out loans of up to £10 000 for installations such as loft insulation and new boilers to help their homes save energy. Expected to be launched later this year, the 'golden rule' of the Green Deal is that the cost of your monthly loan repayments must always be less than the savings you make on your energy bills. The scheme recently ran into trouble when major backers of the Green Deal reportedly wrote to Nick Clegg saying they would not be progressing their preparations for the scheme until the government had outlined a clearer strategy. npower, E.ON and Marks and Spencer, all instigators for the scheme, highlighted concerns around the lack of detail of how the Green Deal will exactly work. However, Greg Baker, the Minister of State for Energy and Climate Change, said the Green Deal will 'open up the energy-efficiency market' for small businesses, support 1 million jobs, and support the UK's aim to reduce carbon emissions. Having your home fully insulated, is expected to reduce energy bills by around £310, whilst a replacing an old boiler could save as much as £237 a year. 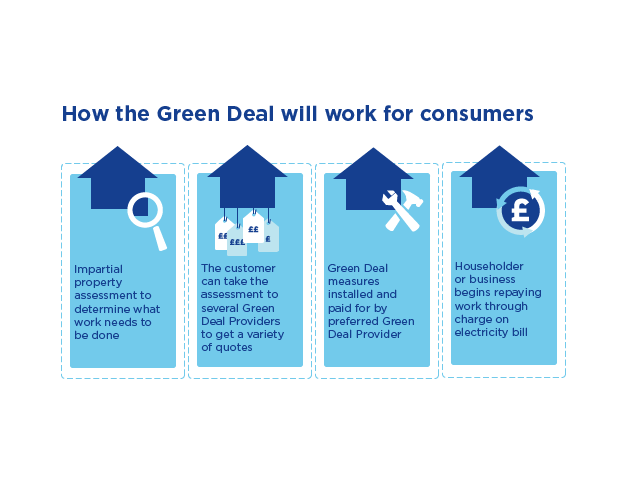 What is the Green Deal and how will it help me?